Please note that I have sold this on December 11, 2009. 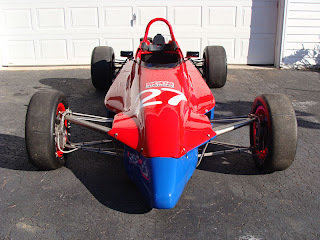 For sale is an immaculate condition, restored and updated Citation Formula Ford. The race car was stripped down to a bare chassis in 2001 and everything on the car was either rebuilt or replaced with newer technology. It also has a new engine built by Jim at Justice Racing Engines with a "runoffs" aluminum head and forged pistons with no track time. The car is complete, race-ready with spares and log books are available. Since the restoration the car has not been road raced. The car has competed in two autocross events for final engine and chassis tuning. Bodywork painted Red and Blue with exact PPG paint codes from a 1990 Nissan GTP ZX-T. Complete engine built, dyno'd and tuned by Justice Race Engines. Clear leading edge tape - saves the paint! Book "Hanes Weber carburetor rebuild"
Book "How to Build and Maintain Competitive FF 1600 Engines" by Jake Lamont. Wall that separates car from living quarters.